As the summer growing season slowed the wind picked up and in a big gust, one of my massive, heirloom tomato plants tipped over and plopped her fruit onto the garden bed. Not quite ripe, nor ready to eat, I have been using the brown bag ripening technique with great success. 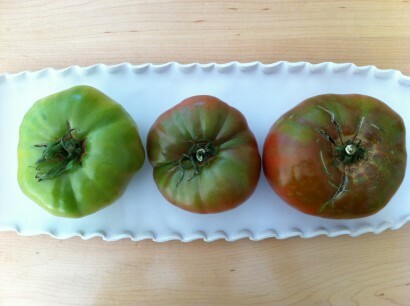 Proud to show off a before brown bag ripening tomato on the left, one in process in the middle and a ready to eat tonight one on the right, perfectly placed on a fluted edge platter that I just finished. Feeling very good about my productivity- something lovely on which to serve food that I grew in my own garden!